Discover the greatness of analyse people! Read More and discover the Easy Way to analyze others! If so, you’ve found the book you’ve been looking for! How To Analyze People: Learn to manage your relationships with the Art Guide of the Psychology of Human Behaviors. Acquire the ability to instantly read people and body language analysis: . 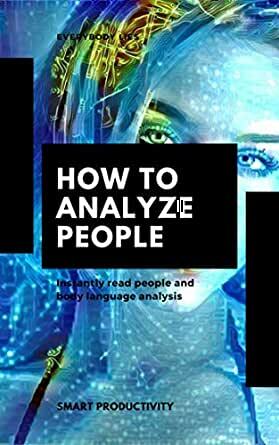 Get the Basics and Fundamentals You Need to Start analyse people – Order this Book Today! The importance of non-verbal communication when judging. Start Your New Social Life Today – Scroll Up and Order this Book Right Away! The good thing about knowing how to analyze a person by their body language is that you learn to distinguish the interest of people who are really worthwhile. You will not have to suffer anymore to see how that friend leaves you behind once he has helped you start your business or has left you money. Analyzing your smile, your facial gestures, your body gestures, the type of gestures, how body language has, how your body language varies with certain questions ... So you will know how to analyze a person and see how he is inside. So if you are looking to analyze people, manage their relationships, control their social life and read their next movements, then you can start investing in this incredible ebook. Here begins our journey to a wonderful life with simple steps and privileged information. COME ON!. Scroll up and click on the BUY NOW WITH ONE CLICK button to start your analisys people adventure TODAY!